This photo has been going around over the last week or so. It’s a picture of mechanically separated chicken. Giant processing plants (like Tyson’s) go through a lot of chicken in a day. After removing the breasts, thighs, wings, and drumsticks, you’re left with scraps that no one is going to actively seek out. Prior to the 1960s, the scraps would be thrown out. New industrial techniques allowed processors to extract more value from chicken carcasses by separating out edible connective tissue and mashing it into a what resembles a chicken paste. Mechanically separated poultry is a paste-like and batter-like poultry product produced by forcing bones, with attached edible tissue, through a sieve or similar device under high pressure to separate bone from the edible tissue. 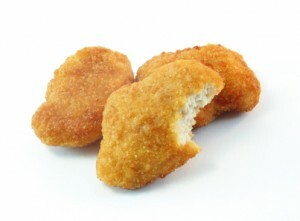 Mechanically separated poultry has been used in poultry products since the late 1960’s. In 1995, a final rule on mechanically separated poultry said it was safe and could be used without restrictions. However, it must be labeled as “mechanically separated chicken or turkey” in the product’s ingredients statement. Recent discussion about mechanically separated chicken suggests that processors are throwing everything (bones and all) into the masher. This is not quite accurate. Contrary to what is claimed, the process does not involve the grinding up of entire animal carcasses (“bones, eyes, guts, and all”) into one large, amorphous glob of meat; it is a technique for removing what is left on the bones of a carcass after all other processing has been completed. 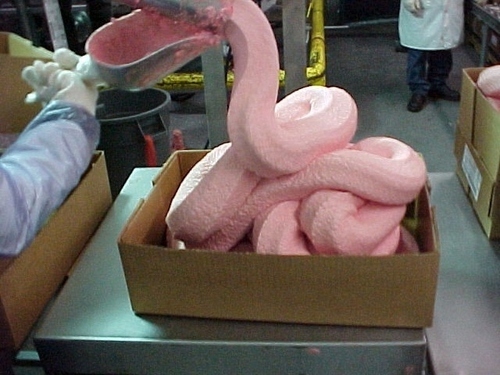 Making the mechanically separated chicken safe for human consumption presents another challenge. Processors may use ammonia to reduce high bacteria counts. Once it’s this processed, mechanically separated chicken is versatile—it can live out its dream to become practically anything. And so it ends up as the chicken in chicken nuggets, the Jim in Slim Jims, and the dog in hot dogs (check the ingredient label for ‘mechanically separated’). Cheaper pet food will often contain mechanically separated chicken as well.